Curly, a cowboy, is in love with Laurey, a farm girl, but they both are too proud and stubborn to show it. A rivalry between the local farmers and cowboys over fences and water rights leads to tension even in romance. Curly looks forward to the beautiful day ahead ("Oh, What A Beautiful Mornin'"). He and Laurey tease each other while Laurey's Aunt Eller looks on ("Surrey With The Fringe On Top"). The sinister and dark-hearted outsider farm hand, Jud Fry, also sets his sights on Laurey. He asks her to the "Box Social", a dance that includes an auction of lunch baskets prepared by the local girls. She accepts to spite Curly. Meanwhile, cowboy Will Parker, returns bedazzled from a trip to the relatively modern Kansas City ("Kansas City"). But he is upset that his girlfriend, Ado Annie, romances ("I Cain't Say No") other men-–especially the peddler, Ali Hakim, who appreciates her passion but doesn't want to get married ("It's a Scandal! It's a Outrage!"). Curly finds out that Laurey is going to the Box Social with Jud and tries to convince her to go with him instead. Afraid to tell Jud she won't go with him, Laurey warns Curly off by telling him that "People Will Say We're in Love." Hurt by her refusal, Curly goes to the smokehouse where Jud lives, and the rivals have an ominous confrontation ("Pore Jud Is Daid"). After Curly leaves, Jud's resolve to win Laurey becomes even stronger ("Lonely Room"). Confused and fraught by her feelings for Curly and her fear of Jud, Laurey muses ("Out of My Dreams"), then falls asleep, dreaming ("Dream Ballet") of what marriage to Curly would be like. Her dream takes a nightmarish turn when Jud replaces Curly, and she can't escape him. She wakes from her nightmare and reluctantly leaves with Jud to go to the Box Social. At the social, the farmers and ranchers make peace ("The Farmer and the Cowman") in a teasing way. Curly outbids Jud in the auction for Laurey's basket, which, as is apparent to all watching, has really turned into a battle for Laurey herself. Later that night Will and Ado Annie work out their differences ("All Or Nothin'"). Jud confronts Laurey about his feelings for her. When she admits that she doesn't return them, he threatens her. She then fires him as her farm hand and screams at him to get off her property. Furious, Jud leaves; Laurey bursts into tears and calls for Curly, who comes to her rescue. They finally admit their love for each other ("People Will Say We're In Love," reprise). Three weeks later, a drunken Jud reappears at Curly and Laurey's wedding. He attacks Curly and falls on his own knife, accidentally killing himself. The wedding guests must hold a makeshift trial for Curly. The judge, Ado Annie's father, declares the verdict "not guilty! 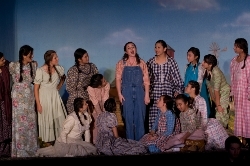 ", and everyone, especially a terrified Laurey, rejoices ("Oklahoma!") in celebration of the territory's impending statehood. After more rejoicing, Curly and Laurey depart on their honeymoon.